As you walk through the woods of Worcestershire, you can't help noticing loving creatures all around you, staring at your every move, following your quiet pace, wanting to have a nice talk with you. 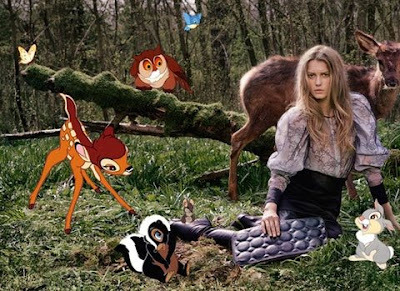 Stella McCartney's autumn/winter 2009-2010 campaign revolves around this fantastic, dreamlike setting, in which the characters of Walt Disney's "Bambi" come to life and share part in the fashion industry. The photographs are a delight, they feature model Sigrid Agren, and will debut in Vogue's international issues.